Baking a huge variety of holiday cookies on your own means recipe cards all over the counter, endless batches of cookies in and out of the oven, and spending a big chunk of December in kitchen lockdown. 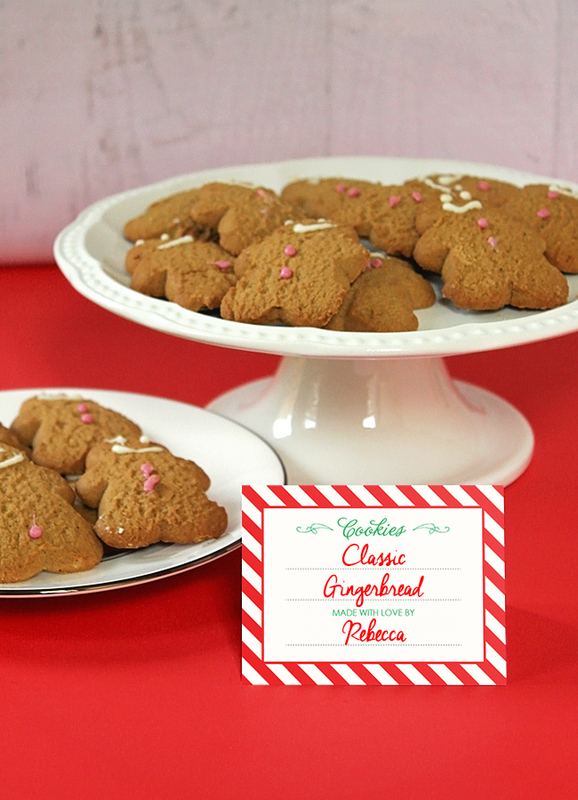 Instead of flying solo, throw a party and invite your friends over for a holiday cookie exchange! Not only do you get to share your favorite cookies and recipes with friends, but you get to sample more delicious creations too. Here’s how to plan and host a flawless cookie exchange this holiday season (including using some darling free printable cookie labels!). Set a date three to four weeks in advance, and send invitations out to your guests. Be sure to indicate how many cookies each guest should bring. Ask each guest to bring enough cookies to swap with each person attending the party, plus an extra dozen for sampling, so everyone gets enough to taste and take. For a small party you might ask everyone to bring a dozen cookies per guest (6 guests would make 6 dozen cookies each). For a large party, you might request 6-8 cookies per guest. Don’t forget, as the host you need to make cookies of your own, too! There are so many cute and creative ways to display the cookies and treats! Start with the holiday plates and nice serving dishes that you already have. In the space that’s left, mix in festive table decorations. As your party guests arrive, they can arrange their cookies on the serving dish of their choice. 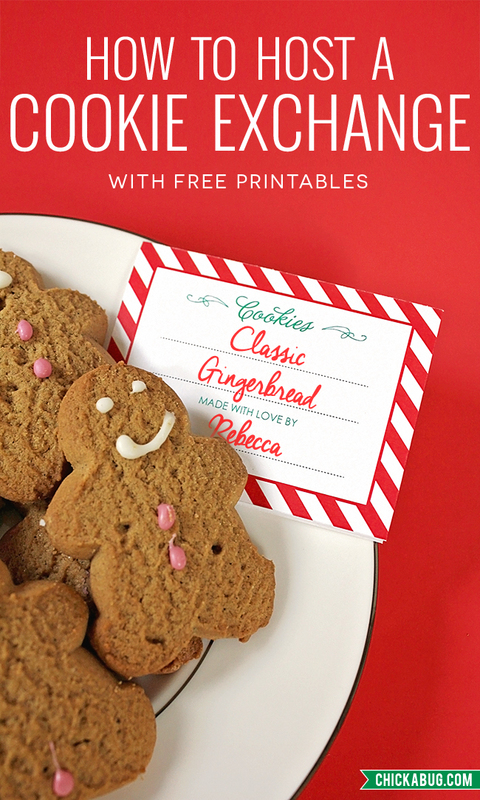 Have each person fill out their free printable cookie label (download below) with the name of their cookies to complete the display. Once the table is set, remind the guests how many of each cookie they can take, and then the cookie “shopping” can begin! Snacks – You and your guests will be sampling lots of cookies, so keep the rest of the party food simple. Set out snacks such as mixed nuts, cheese and crackers, and veggies and dip. Offsetting the sweet treats with some savory munchies will add balance to the menu. Drinks – Serve wine or a simple mixed drink, hot cocoa, and tea or coffee. Ice cold milk is always a hit – what goes better with cookies than milk? Don’t forget water, too, to keep your guests hydrated and their palates fresh. 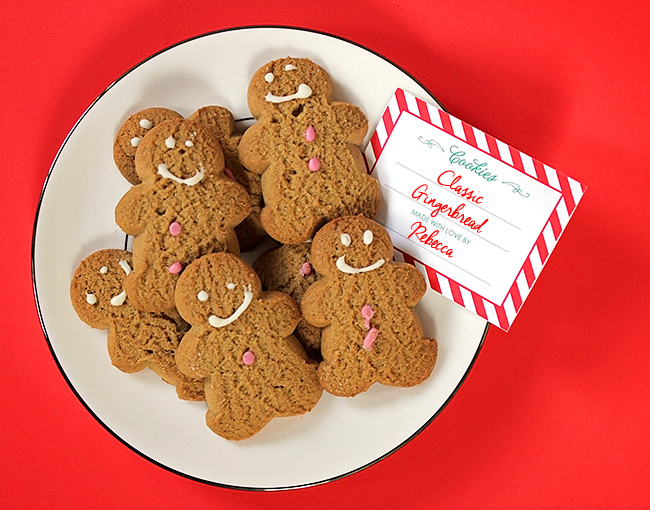 Icebreaker – Have your guests tell the story behind the cookies they brought. Is it an old family recipe? Their life-long favorite? This makes for great conversation and adds a personal touch to the party. 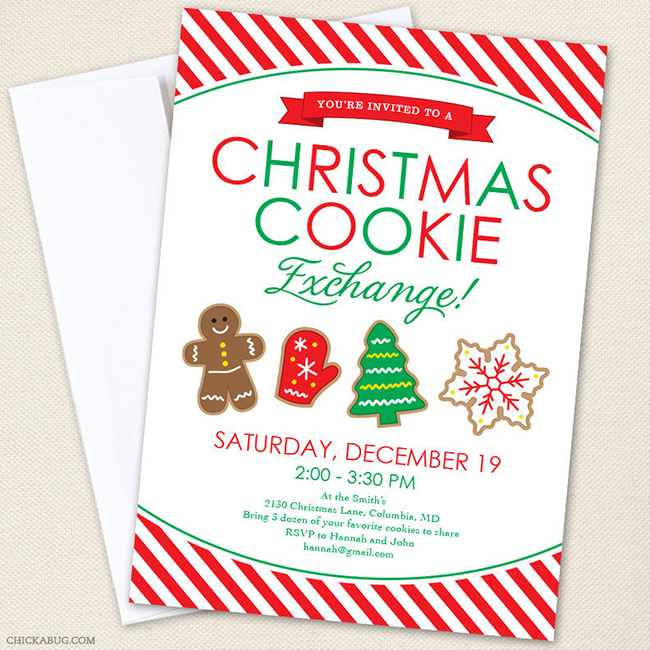 Favors – Make your cookie exchange party the talk of the town! Outside of the beautiful and delicious cookies, send guests home with additional party favors. A set of cute cookie cutters or a bag of hot chocolate mix are nice ideas. Of course, the best part about the cookie exchange is that everyone gets new and exciting cookies to take home! Make the cookie packing a creative experience by setting up a packing station with plain cardboard boxes, tissue paper, stickers, stamps, twine, and ribbons, so guests can jazz up their boxes. Besides the pretty supplies, you’ll want functional ones, too, like plastic wrap, foil, sturdy paper plates, and large ziploc bags. After the party is over you can keep the cookies for yourself or give them as delicious (and adorable) gifts. For gift-giving inspiration, check out these packaging ideas from Martha Stewart and My Recipes. I hope these tips help you plan and host a stress-free cookie exchange party this holiday season! Can't wait to host my cookie exchange!! Hi Brooke! I don't have an invitation, sorry! Excited to host my first cookie swap!